AUGUSTA — A more than 20-year tradition continued in Augusta Wednesday, Jan. 25. About 40 Aroostook County business leaders, economic development officials and others gathered with more than 25 Maine lawmakers for Aroostook Day at the Legislature. The event, sponsored by the Aroostook Partnership, is an opportunity for members of the private, public and nonprofit sectors of Aroostook County to interact directly with the Aroostook County delegation and other legislators from downstate. Bob Dorsey, President of the Partnership, said Aroostook Day was a signature event for LEADers Encouraging Aroostook Development (LEAD) and when the Aroostook Partnership for Progress and LEAD merged into the Aroostook Partnership it was decided that it was important for Aroostook Day to continue. Senate Minority Leader Troy Jackson, a long-time legislator from Aroostook, is no stranger to Aroostook Day and has attended many in the past. Partnership Chairman Chris Anderson, President of F.A. 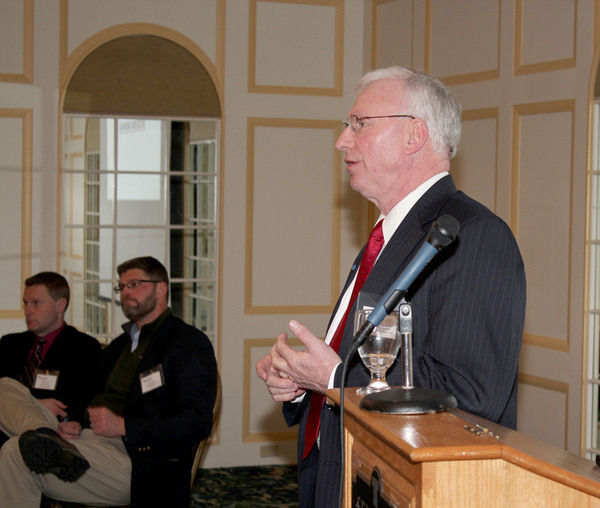 Peabody, welcomed the legislators and Aroostook contingent to the event and provided some background of Aroostook Day. He also talked about the Partnership and how the organization speaks with one voice to encourage, advocate and support economic development in northern Maine. Following the dinner, a more formal program on three topics was presented by three panelists. Jason Parent, Executive Director of Aroostook County Action Program, discussed workforce issues and two pieces of legislation forwarded by Presque Isle Representative Trey Stewart. Parent advocated support for “An Act to Support Working Families” and “An Act to Promote Workforce Participation”. The proposed legislation would address the so-called welfare cliff, where some people benefit greater by staying on certain forms of public assistance than by entering or reentering the workforce. The second panelist, Dana Doran, Executive Director of the Professional Logging Contractors of Maine, presented a quick look at the forest economy of Maine and recent recommendations to improve its outlook. Doran said the industry is facing challenges, but there are five important efforts to grow the forest economy. The first of which is to conduct a global market analysis for future wood products. The other steps include conducting a statewide wood supply analysis, grow low value wood opportunities and develop an integrated marketing plan. The final topic for formal discussion was the potential for mining in Maine and the difference between modern mining and legacy mining. Dorsey said with the mining rules coming before the Maine Legislature for the third time in five years, it is important to separate emotion from facts and urged lawmakers to consider the possibility that you can have economic growth based on the state’s natural resources and still protect the environment. Representative John Martin, who sponsored the 2012 mining rules bill, said this latest bill would provide the most comprehensive mining rules in the nation. Dorsey added the primary focus of the mining discussion was to point out the tremendous economic benefit an industry like mining would have for both Aroostook and Maine. After the panel discussion, lawmakers in attendance were asked to identify themselves and their district and share their thoughts on the legislative session or why they attended Aroostook Day. 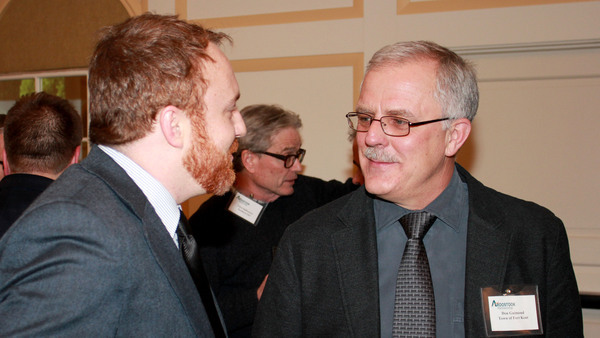 “It was pleasing to hear many lawmakers note how Aroostook County folks, unlike some other areas of the state, are willing to work together to achieve goals,” added Dorsey. Top right photo: Aroostook Partnership President Bob Dorsey addresses the legislators and County residents who attended Aroostook Day at the Legislature. Also pictured are from left, Jason Parent, Executive Director of ACAP and Dana Doran, Executive Director of Professional Logging Contractors of Maine. Bottom center photo: Fort Kent Town Manager Don Guimond chats with Senator Nate Libby of Lewiston during the social hour.